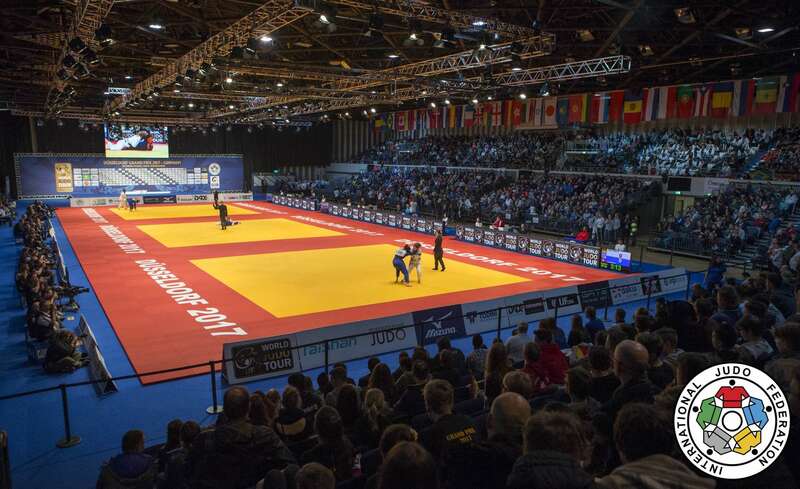 The Dusseldorf Grand Prix 2017 continued to provide a veritable feast of world-class judo as the middleweights graced the Mitsubishi Electric Halle on Saturday. The IJF World Judo Tour’s first Grand Prix on the 2017 calendar featured four categories on day two as medallists were crowned in the women’s -63kg and -70kg categories and the men’s -73kg and -81kg categories. Russia dominated the men’s divisions as they won -73kg and -81kg gold while France took the -63kg title and Japan clinched the -70kg gold to remain out in front. The Dusseldorf Grand Prix 2017 will come to an explosive finale on Sunday with the heavyweights in action. The men’s -90kg, -100kg and +100kg categories will feature on the three mats in addition to the women’s -78kg and +78kg categories. Rio 2016 Olympic champion Lukas KRPALEK (CZE) is fresh off a lengthy training camp in Japan and is ready to start a new chapter in his illustrious career as moves up to the +100kg category on Sunday. 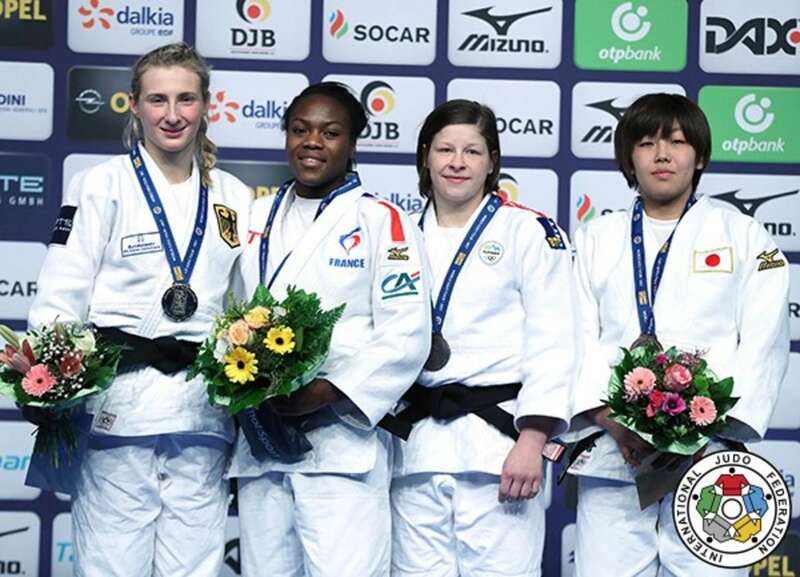 Rio 2016 Olympic silver medallist Clarisse AGBEGNENOU (FRA) was back on top of an IJF podium for the first time in over a year with a straightforward win over European Games winner Martyna TRAJDOS (GER). AGBEGNENOU lead her head-to-head series with TRAJDOS 6-1 coming into the final and extended her one-sided rule over the German judoka by throwing spectacularly for ippon with an osoto-makikomi after 32 seconds. AGBEGNENOU, who has medalled at every IJF event she has entered since 2012, shut out TRAJDOS – who came up short in her quest to win her home event for the first time – and now has arch—rival Tina TRSTENJAK (SLO) in her sights. AGBEGNENOU said: “I came here with the hope of fighting Tina again but it was not to be today. I know we will meet again soon and I will be ready. I know I can work harder and I need to if I want to win European and world medals again. In the first semi-final Junior world champion NABEKURA Nami (JPN) was topped by home opposition as TRAJDOS won by a waza-ari from a ko-uchi-gari. In the second semi-final AGBEGNENOU picked up Qingdao Grand Prix silver medallist Lucy RENSHALL (GBR) with her trademark ura-nage for a waza-ari and the Brit tapped out just as her opponent moved into the osaekomi. The first bronze medal was won by Rio 2016 Olympic champion and world champion Tina TRSTENJAK (SLO) as RENSHALL could not compete having picked up an elbow injury in her semi-final loss at the hands of AGBEGNENOU. The second bronze medal was won by NABEKURA who beat teammate and former Tokyo Grand Slam winner TSUGANE Megumi (JPN) after two minutes of golden score. 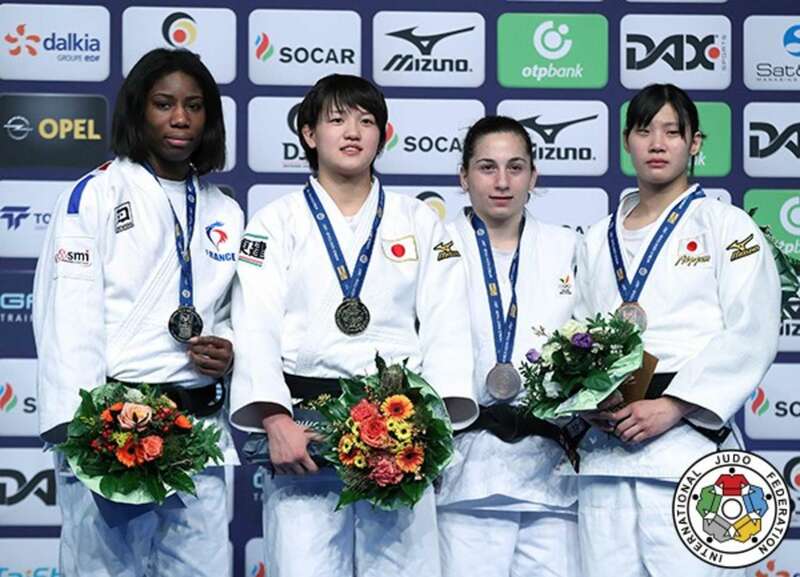 TSUGANE, 21, who last won an IJF medal in 2014 when she captured bronze at the Qingdao Grand Prix in 2014, finished the four minutes with a shido against her name but a contest cannot be decided on shidos in regulation time. After a couple more minutes and a continued lack of attacking intent from both judoka the referee issued a shido for passivity to both judoka which made the younger judoka NABEKURA the winner. Paris Grand Slam winner ARAI Chizuru (JPN) won her second IJF World Judo Tour event in the month of February to maintain a 100% record in 2017. 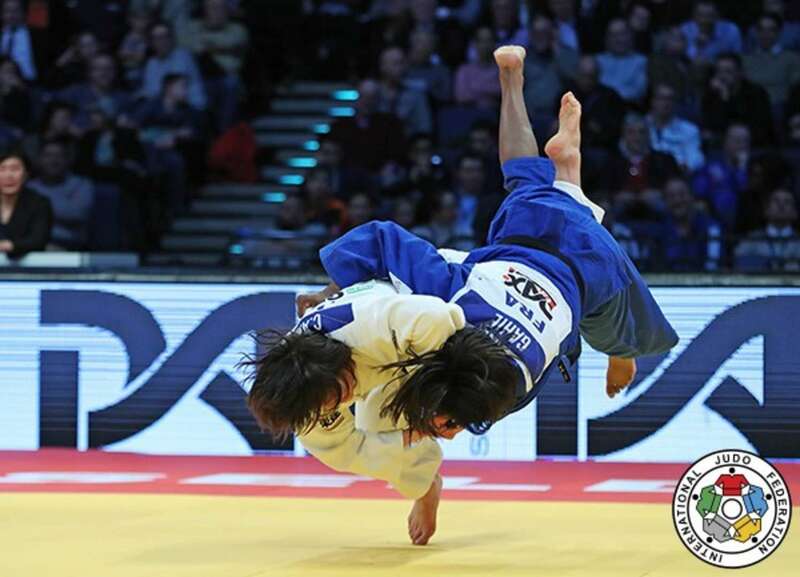 ARAI, 23, broke the deadlock with a waza-ari from an uchi-mata against Abu Dhabi Grand Slam winner Marie Eve GAHIE (FRA). The Japanese judoka added a second waza-ari and wrapped up her young French foe with a mune-gatame hold to win gold. 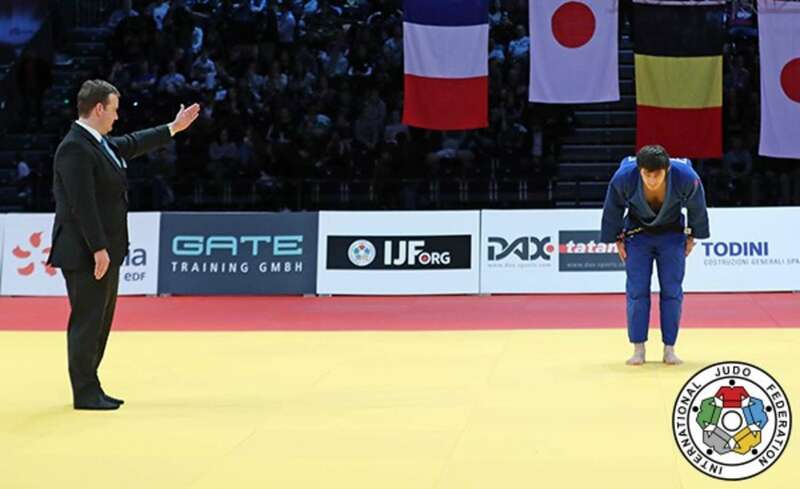 In the first semi-final ARAI Chizuru (JPN) drove Paris Grand Slam bronze medallist Sanne VAN DIJKE (NED) over with a picturesque uchi-mata for ippon. In the second semi-final GAHIE (FRA) threw former Cadet European Championships winner Giovanna SCOCCIMARRO (GER) with a ura-nage for ippon at the point of their contest. The first bronze medal was claimed by former Warsaw European Open bronze medallist Lola MANSOUR (BEL) who derailed the plans of 19-year-old German Championships bronze medallist COCCIMARRO as the former won the first Grand Prix medal contest of her career by a waza-ari. The second bronze medal was captured by 20-year-old Tokyo Grand Slam winner NIIZOE Saki (JPN) who defeated VAN DIJKE, 21, with a waza-ari score in golden score from an uchi-mata on the edge of the contest area. Former World Judo Masters winner Denis IARTCEV (RUS) ruled the -73kg category in Dusseldorf as he defeated Rio 2016 Olympic bronze medallist and London 2012 Olympic champion Lasha SHAVDATUASHVILI (GEO) in the final. IARTCEV, who was trying to avenge a Rio 2016 repechage defeat to the Georgian, went ahead with a waza-ari from a nice piece of ashi-waza and concluded a fine outing by ippon from a ko-soto-gake. In the first semi-final SHAVDATUASHVILI defeated Paris Grand Slam bronze medallist Tohar BUTBUL (ISR) after the Israeli received three shidos and hansoku-make. In the second semi-final Abu Dhabi Grand Slam winner Tommy MACIAS (SWE) was thrown with a beautiful osoto-makikomi by IARTCEV (RUS) for ippon after one minute of action. The first bronze medal contest saw MACIAS return to winning ways at the expense of home judoka and Havana Grand Prix bronze medallist Igor WANDTKE (GER). The Swede’s sutemi-waza earned a waza-ari score and that was the difference at the end of the four minute contest. The second bronze medal went to former Tyumen Grand Slam silver medallist Guillaume CHAINE (FRA) who prevailed against rising contender BUTBUL. 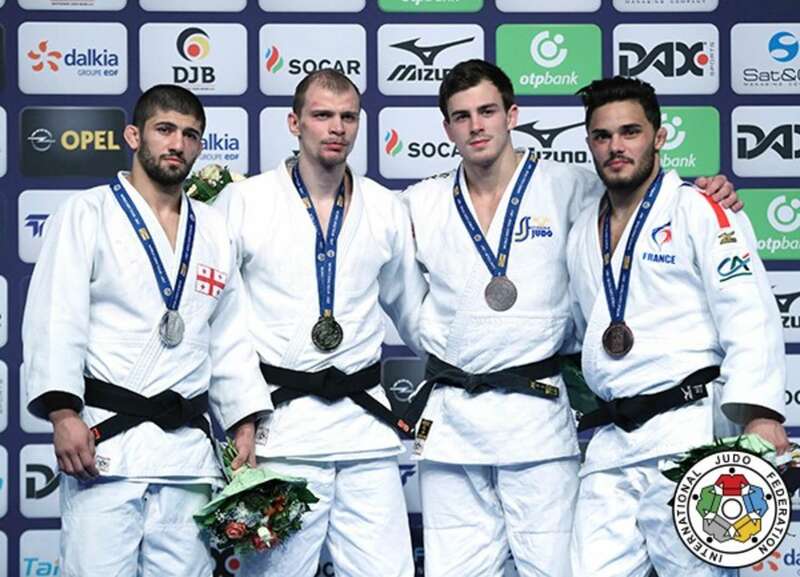 CHAINE won his first Grand Prix medal by throwing with his ippon seoi-nage for a waza-ari as France continued their climb up the medal table on day two. World number 15 Aslan LAPPINAGOV (RUS) struck in Germany as he received -81kg gold with a battling performance. The Russian, who has a whole star-laden roster to compete with at this weight in his homeland – including the reigning Olympic champion Khasan KHALMURZAEV (RUS) – was spared from a meeting against Budapest Grand Prix bronze medallist UNGVARI Attila (HUN) in the final as the Hungarian could not compete having sustained a right knee injury from a tai-otoshi attempt in his semi-final. In the first semi-final former Junior European Championships bronze medallist Dorin GOTONOAGA (MDA) was subdued by UNGVARI Attila (HUN) via shime-waza as the Hungarian showed his effective ne-waza once again having also won his quarter-final on the ground. 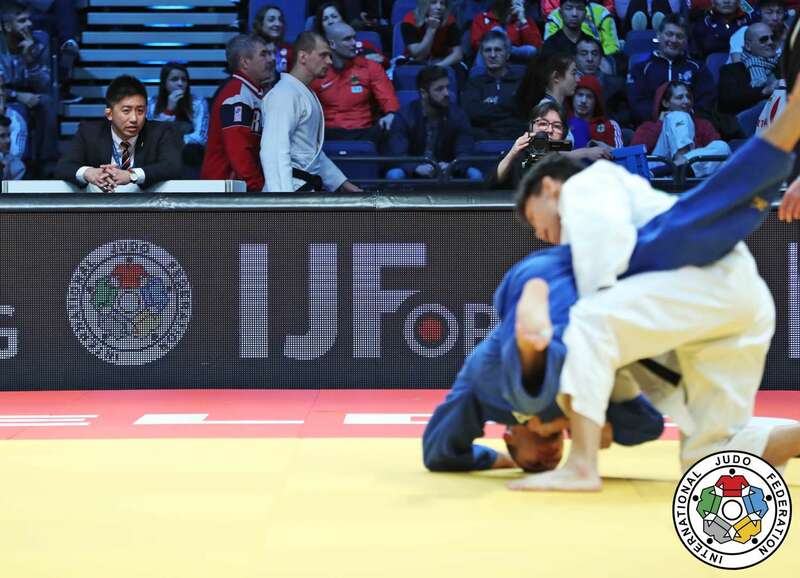 In the second semi-final a clash of the Tokyo Grand Slam bronze medallists saw Ivaylo IVANOV (BUL) lost out after 30 seconds of golden score to LAPPINAGOV. The Russian opened the scoring with a waza-ari with 37 seconds left but IVANOV restored parity with 20 seconds remaining. LAPPINAGOV came up with a match-winning score in added time and advanced. The first bronze medal was won by IVANOV who bested Glasgow European Open silver medallist Benjamin MUENNICH (GER) by a waza-ari score. 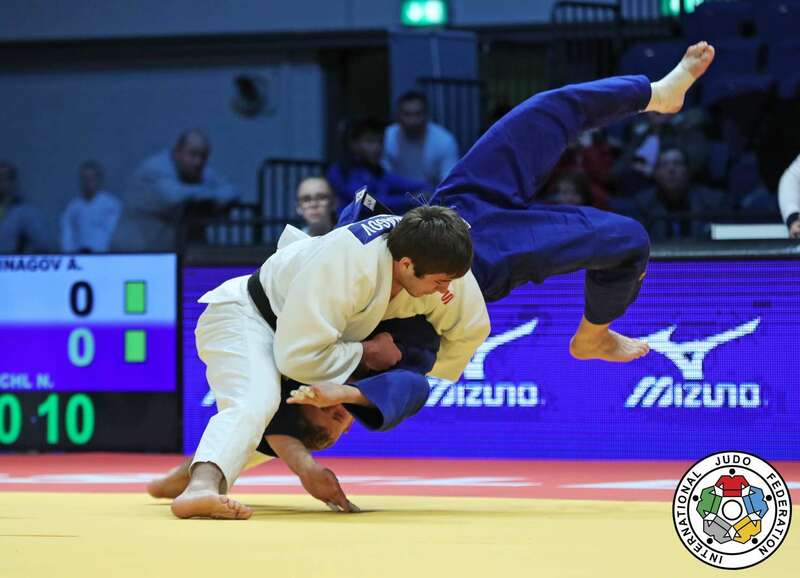 World number five IVANOV, 22, who was funded to compete in Germany by the IJF, threw his rival beautifully with a sumptuous drop seoi-nage. 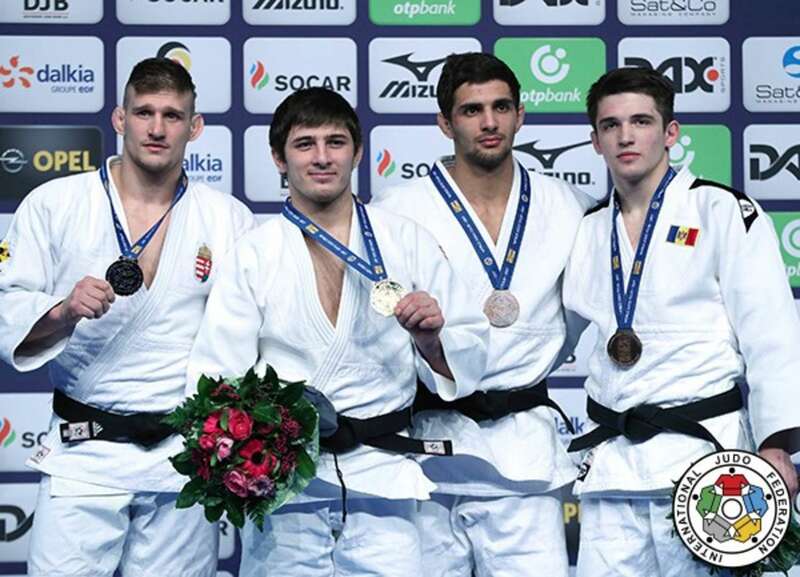 The second bronze medal was claimed by GOTONOAGA in dramatic fashion as he switched his body cleverly to throw 21-year-old Junior European Championships silver medallist Anri EGUTIDZE (POR) for ippon. EGUTIDZE, who moved with his family when he was growing up from the Western side of Georgia to Portugal, was caught with a tani-otoshi with five seconds left for the maximum score.